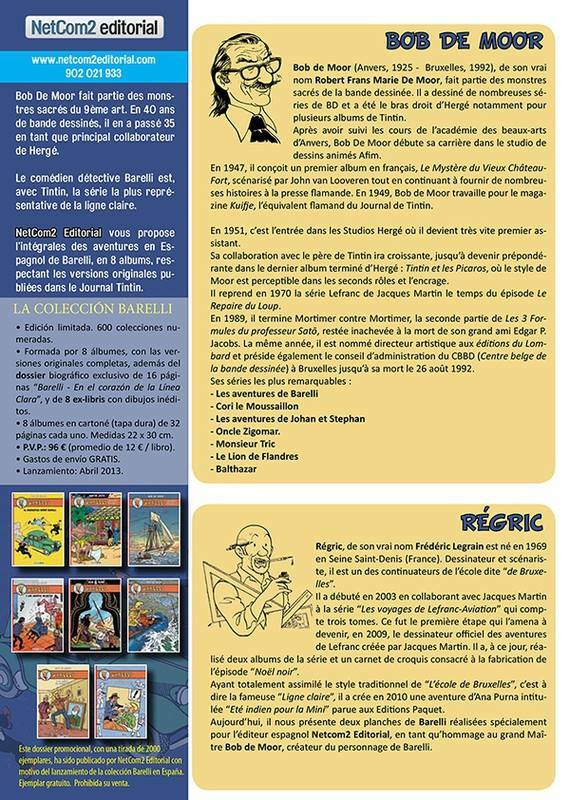 The entire Cori le Moussaillon collection by Bob de Moor will be re-released by BD Must. Not such a surprise as BD Must have already shown with their Barelli and Tric collection that they have more than a just a bit of affinity with the work of de Moor. So what can you expect: the full 5 albums (including the first volume in the original 62 pages version from 1951 & in colour !) 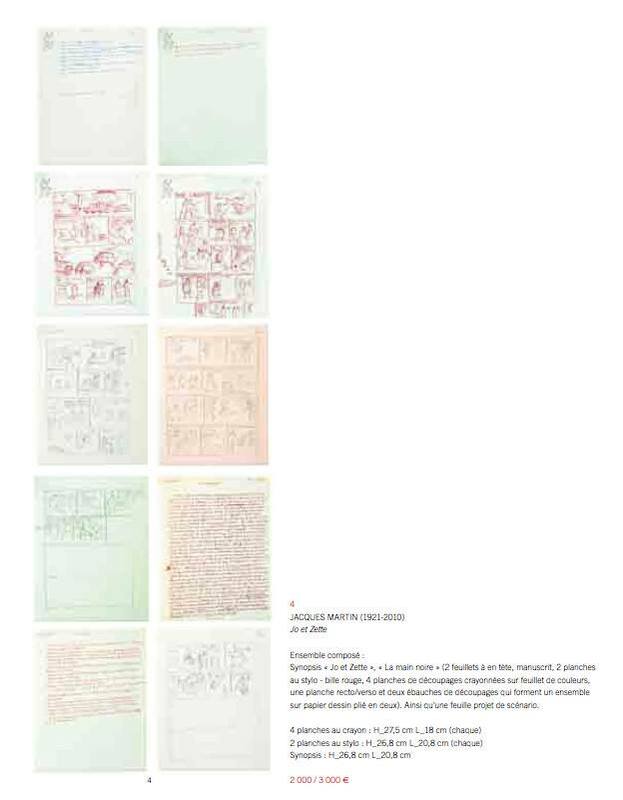 + a dossier of 24 pages “Récits de mer” including 3 stories which previously never were released in an album format. 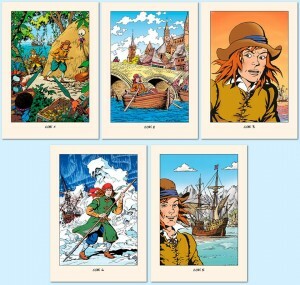 Also included in the packet – which will be yours for 99 Euros – are 5 numbered ex-libris (see the picture attached). Only 1000 copies will be made of these. 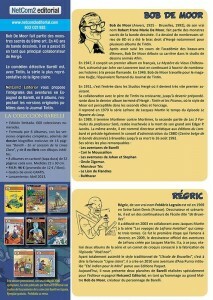 The albums will be available in French but also in Dutch and German. Note that the Dutch and French version will not have the dossier and the ex-libris, but instead will have a certificat signed by the de Moor family! Check the complete info at http://www.bdmust.be/djp_cori.htm . 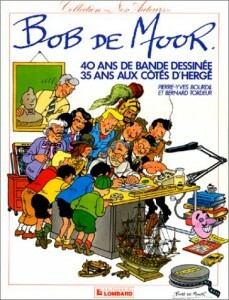 Amazon France has a few copies left from this must have book on Bob de Moor: Bob de Moor. 40 ans de bandes dessinées, 35 ans aux côtés d’Hergé . 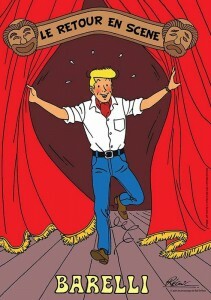 It’s an excellent read and will give you a good view on what this artist has meant to the Hergé Studios. 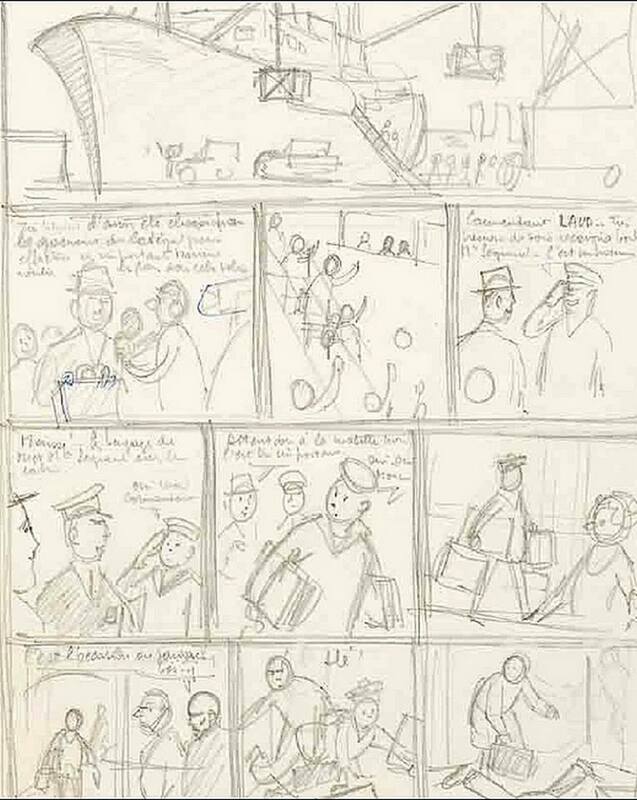 And although in French, the images will speak for themselves. Recommended reading although the prices are getting quite high (but expect them to rise even more in the next months as there will be a lot more attention for Bob de Moor). 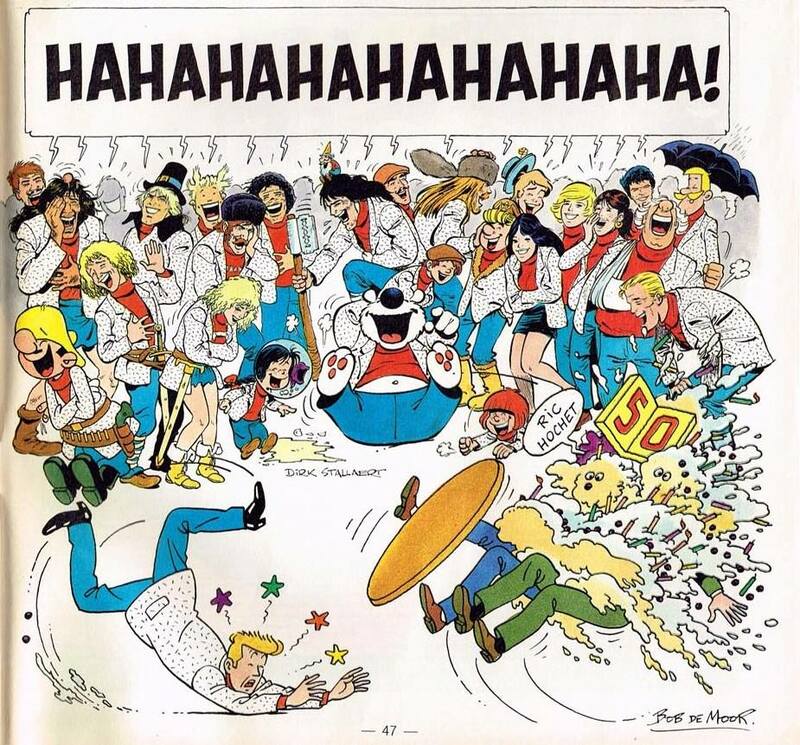 Here’s a Ric Hochet anniversary cartoon on which Bob de Moor collaborated with that other flemish multi-talented artist Dirk Stallaert. 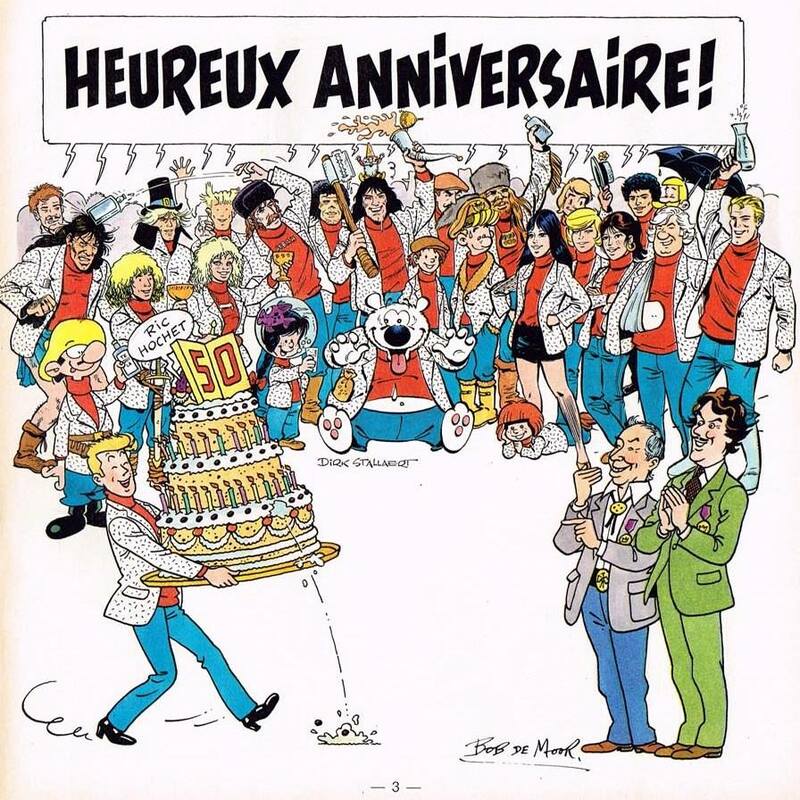 The cartoon features scenarist A.-P. Duchâteau and Tibet next to a whole string of cartoon characters all drawn by Stallaert (who with Nino already has shown he is perfectly able to complete the Alph-Art album in a perfect Hergé/de Moor way… but that’s another discussion). 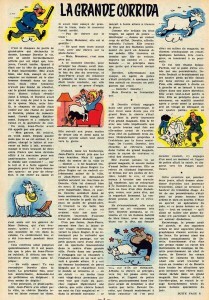 Bob de Moor did also take care of some of the ‘side animation’ (so to speak) in the early Tintin magazine. 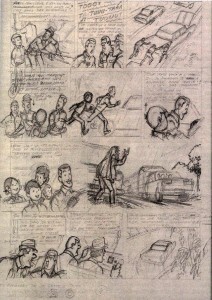 Here’s a page from 1952. 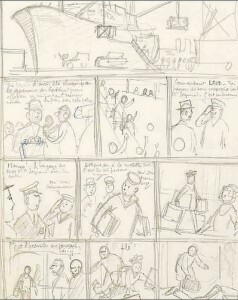 After Jacques Martin left the Hergé Studios he also took with him the material from the uncompleted Jo et Zette story “La main noire” he collaborated on with Bob de Moor. The lot ended up in an auction last year. 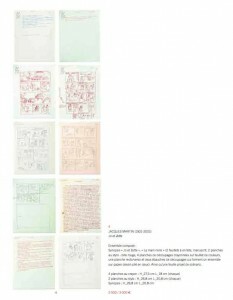 Included in the set were 4 crayon drawn pages, 2 pages in red pen and the synopsis itself. 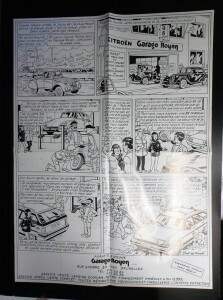 The lot was up for auction at PB&A auction house in 2011. 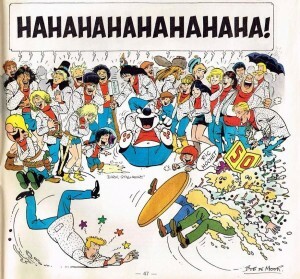 It’s not really clear if Martin actually had the right to take this uncompleted album with him (let alone sell it even) as it was a product by the Hergé Studios. Good to know, de Moor also provided illustrations to the “Le Nain noir” by Scott Walter. Coïncidence? 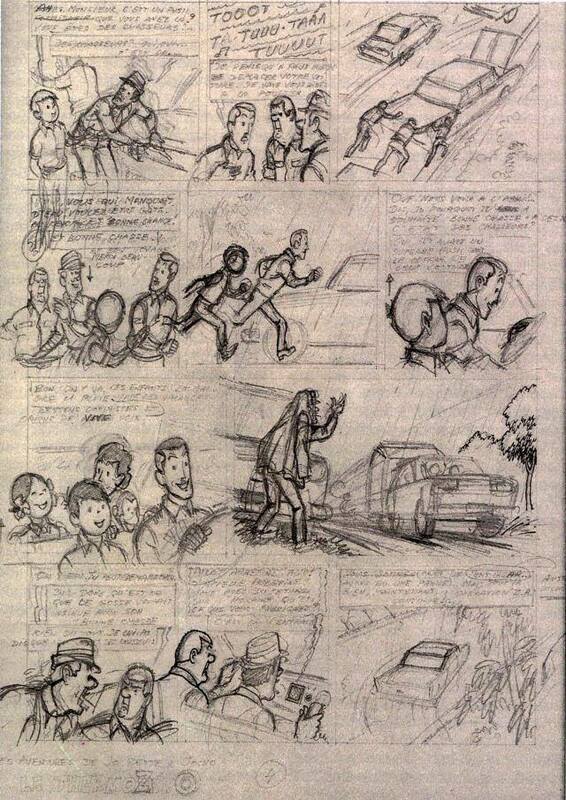 Note that amongst the other lots on offer we also found back the notorious gag page which the members of the Studio once produced to make it appear that they were writing a Tintin book while Hergé was away. 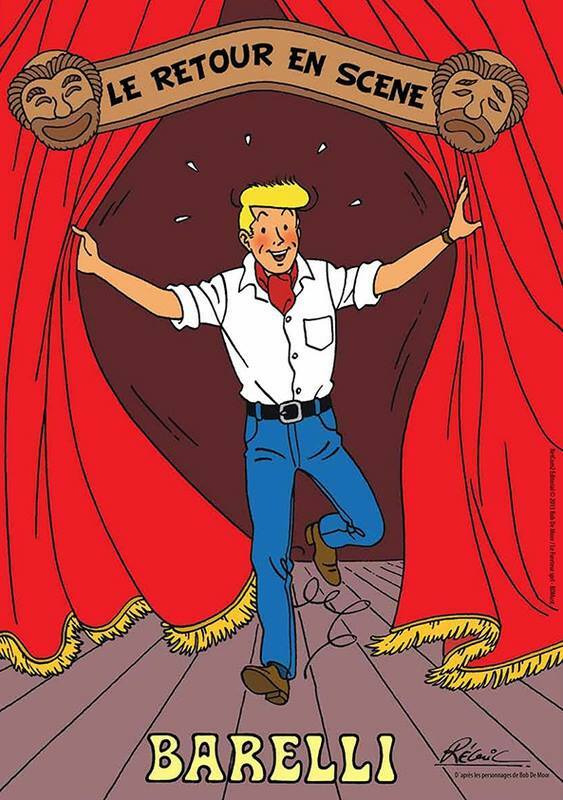 Let’s see if Musée Hergé will do something with this. 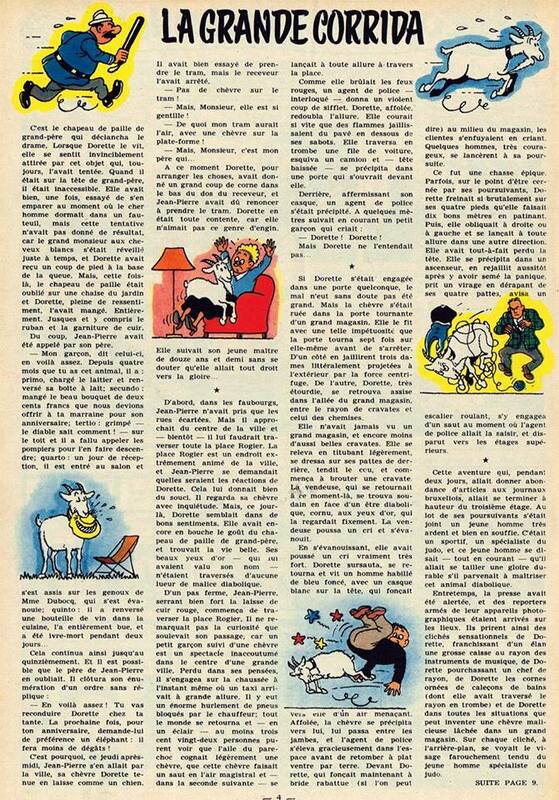 In related family news, Johan de Moor will see his entire “Vache” series re-published via Le Lombard later on this year. 2014 will be a de Moor year for sure. 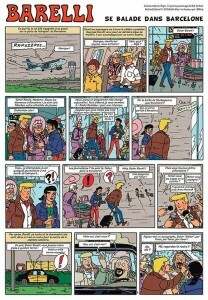 Johan de Moor is planning a comic on his father Bob de Moor. 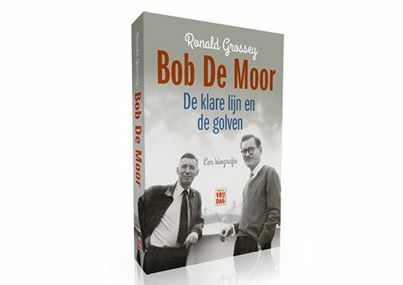 De Moor Senior is back in the picture after the excellent biography by Ronald Grossey was published earlier this year: “Bob de Moor: de klare lijn en de golven”. This must have biography was published by the Flemish publisher Vrijdag and counts 480 pages. Get it now, only 1500 copies are available and just like Grossey’s other book on Will Vandersteen, this one will become a rare item in no time. 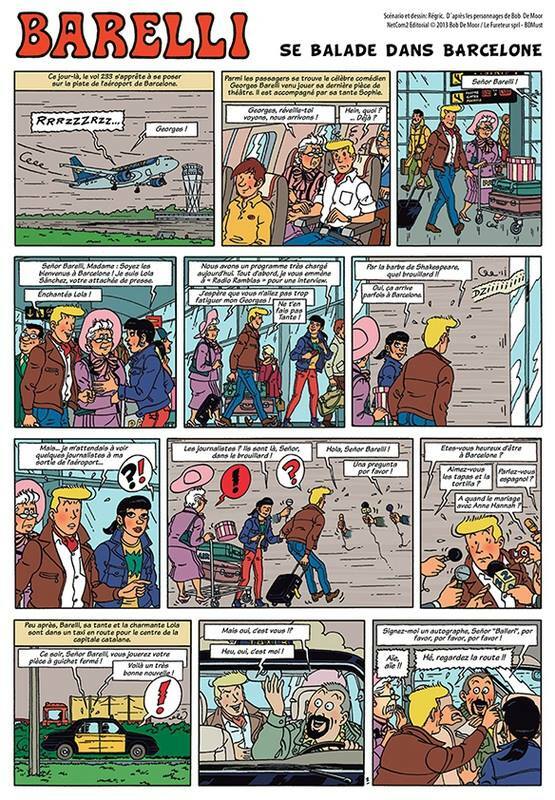 Note that it is not clear whether this is the same comic that fellow comic artists Nix wrote the scenario for (“Mr BD”) but we suppose it is. 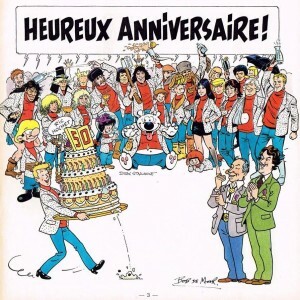 Did you know that Bob de Moor started twice on a Jo et Zette album? The first was with Jacques Martin and was called “La Main Noire” (abandoned because the work on the “Ile Noire” took too much work), the second was the “Thermozéro” album in a scenario by Greg. 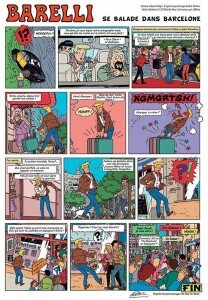 The latter scenario was first used by Hergé for a TinTin album but abandoned. De Moor and Greg never got round to finish the “Thermozéro” album. You can see a scan of 2 pages, one of both aborted albums. The one with the boat is the “La Main Noire” one. In 2013 the comic artist Régric (successor of J. Martin for the Lefranc series) made a brand new Barelli gag for NetCom2. Here are the pages.